I rather take it for granted that prehistory is a magnet for all kinds of fascinating free-thinkers and cultural outcasts, so it’s shocking to learn that Marshack’s question was justified—by history if not by any kind of rounded approach. In terms of creative people seriously approaching the European cave art of the Upper Palaeolithic, Eshleman remarks: “There was the novelist and essayist George Bataille’s 1955 monograph and that was it.” Eshleman set out, in the seventies, to do what Charles Olson called a “saturation job” on the French caves: experiencing them as a poet and scholar, over several decades, and reporting back. This is his report. I think it’s an ironic testament to the depth and honesty of his approach that, on my first reading, Juniper Fuse didn’t really carry the kind of perspective-shifting charge I hoped for. Gradually, as Eshleman’s cave-inspired poetry succeeds his chapters of carefully researched, searching prose, melting here and there into prose-poetry hybrids, one gets a sense of the vastness of Eshleman’s enterprise, perhaps of the huge gulf between us and this stupendous cultural legacy. We’re talking about a relatively continuous artistic tradition spanning nearly 20,000 years, and one which “civilization” didn’t, until a little over a century ago, acknowledge as worth paying attention to. And Eshleman’s poetic reports are drawn from a long period of his life; it’s probably easier to blow a reader away with a few years’ burst of inspiration than with this kind of devoted, patient observation and meditation. But even though no nuclear blast reshapes the mind, Eshleman’s strong and fecund mind ignites plenty of wondrous sparks of luminescence to enrich our vision of these dark, labyrinthine galleries. His poetic guides, after Olson, are beat figures such as Gary Snyder (whom he hung out with in Japan in the early ’60s) and Allen Ginsberg, and his poetry writhes with the wild juxtapositions and unabashed carnality associated with the beats. I wrote of David Lewis-Williams’ staunch rationality not being “such a great qualification for truly getting under the skin of cultures who crawled into dark tunnels to paint bison.” Conversely, not only is it entirely right for a poet to go down these caves, Eshleman is probably just the right kind of poet. His scholarship is solid, taking in all the major archaeologists of the field. He doesn’t spend much time with the recent wave of shamanic trance-oriented theorists, which seems a little odd given that much of his thinking (not to mention his own altered states) seems conducive to this line of research. He may have absorbed the pre-Lewis-Williams schools of thought more deeply in the early stages of his exploration; but a better explanation for this is perhaps precisely his intimate knowledge of the peculiar byways of consciousness. He can embrace the visionary, the imaginal, and the psychotropic in prehistory very well on his own, and the richness of his own perspective has little need of the latest theory. We even get that most rare gem, the subjective basis of objectivity. At one point Eshleman details a potent experience of Reichian therapy in the late ’60s, shortly before he discovered the caves, in which the true depth of his nursing trauma, losing access to his mother’s milk, explodes in a violent but ultimately cathartic spasm of fury. It lays bare his personal investment in his perspective on the caves, in their womb-like moist darkness, and in the traumatic birth of consciousness he sees happening there, the animal being wrenched out onto the cave walls from the “soon-to-be human” artists’ heads. 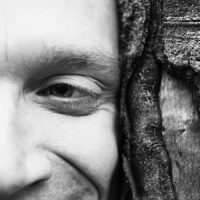 I use the phrase “the subjective basis of objectivity” because I don’t believe a human can devote the energy necessary for such a thorough study of anything without having some deep psychological motivation; and the only way to even approach objectivity is perhaps to become aware of this, and maybe make your audience aware of it. It’s a delicate task, which is why so few attempt it. But Eshleman’s candid revelation of this and other similarly resonant personal ordeals stands as one of Juniper Fuse‘s highest points of recommendation. Alongside the usual references, we find inspiration for interpreting the cave art drawn from Norman O. Brown, James Hillman’s The Dream and the Underworld and—almost shockingly—occultist Kenneth Grant’s Typhonian Trilogies. Indeed, his section on “The Abyss”, wrestling with the significance of the caves’ depths and their sensuous feminine associations, largely draws on Grant’s idiosyncratic esoteric myth-making. It’s shocking because I don’t think I’ve seen Grant used as a reference point outside obscure occult journals before, let alone in a book by a guy on OK terms with the French Ministry of Culture. But yet again, this is why they should send poets. Scientists usually stick to science; poets, artists and magicians are often more catholic, and can embrace scholarly precision if need be, but also absorb crazy wisdom. They’re more objective. 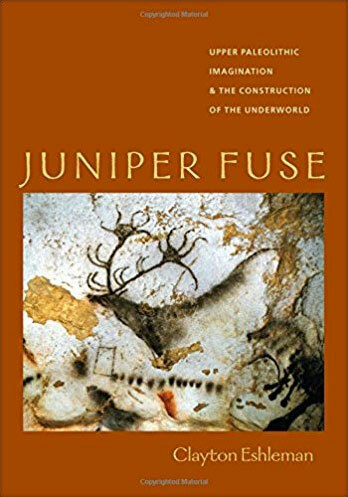 Juniper Fuse by Gyrus is licensed under a Creative Commons Attribution-NonCommercial-NoDerivatives 4.0 International License.